Rae Mahaffey uses color, pattern and complexity to examine the interaction between visual experience and a more conceptual consideration of the structure of human life and the world around us. 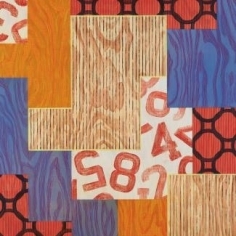 She is less concerned with expressing a specific interpretation than with investigating the layered possibilities of color, pattern and repetition—what Mahaffey calls the “semantics and syntax of visual art.” The vocabulary of her current work incorporates patterns and structures that are both hard-edged and organic in nature, ranging from circles to stripes to wood grains to hints of cellular patterns. This show will include paintings that are oil on wood panel, as well a selection of glass pieces. Mahaffey’s fresh, direct approach is provoking, visceral and contemporary. Rae Mahaffey studied at the University of Copenhagen, Denmark and the University of Washington. She moved from Seattle to Los Angeles in 1988 where she worked as a curator for Gemini G.E.L. and as a consultant for David Hockney's studio. She moved to Portland in 1992 to start Mahaffey Fine Art print studio with her husband Mark. Mahaffey’s exhibitions include shows at the Portland Art Museum, OR, Marylhurst Art Gym, OR, The Fairbanks Gallery at Oregon State University, Corvallis, OR, Maryhill Museum, WA, and the Schomburg Gallery in Santa Monica. Completed commissions include Washington State Arts Commission for Gray Middle School in Tacoma, a project for the Pacific First Center, Harsch Investment Properties in Portland, and a major installation for the El Paso Airport in Texas. 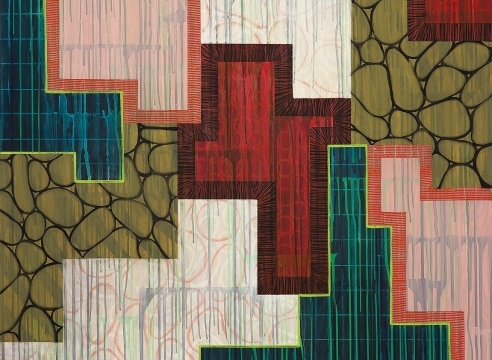 In So-and-So, Rae Mahaffey presented 11 abstract paintings (all 2015) that signal an exciting high point in an already accomplished, 30-year career. Impeccably crafted, with beautiful, layered surfaces, the colorful panels are relatively large for Mahaffey; the biggest are 5 feet tall. Perhaps it was in confronting panels of this scale that she began to register them as human presences, dubbing them Bachelor or Rookie, for example, a conceit she extended to the witty exhibition title. The paintings have “personality”: lively and smart, they engage the eye and the mind with their intriguing complexity. In each case, Mahaffey creates tensions between geometric and organic forms, flat planes and thin volumes, autonomous parts and unified whole.